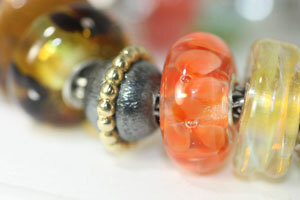 Coral Flower Glass Retired Trollbeads. Light and elegant are these coral-coloured flowers in clear glass. A reminder of the wildflowers at harvest time dancing close on meadows filled with beautiful flowers. Coral Flowers is shown in the photograph below. This is a beautiful bead. It looks different from every angle and I am always noticing something new in it. The flower petals have stripes of orange and pinky-red and each flower has a delicate sphere right in the center. ..this beauty has it all: the best true orange for we orange lovers & delicate flowers for we of the female persuasion..i love it !! Click the button below to add the Coral Flower Bead, retired to your wish list.